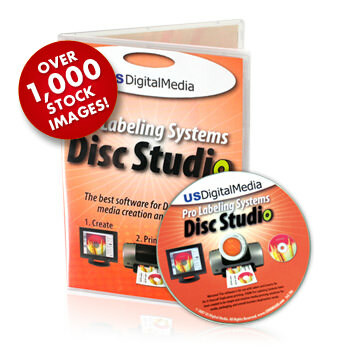 Welcome to USDigitalMedia Pro Labeling Systems' DiscStudio! This software is for use with labels and inserts for do-it-yourself duplication printing. USDM Pro Labeling Systems have been created to be a simple yet intuitive media printing solution for media, packaging, and overall business duplication needs. If you have any questions about our software, please contact us using the question form below. Before you send in your question, be sure to check the DiscStudio User Manual and Frequently Asked Questions pages to see if your question has already been answered! Our customers asked for it, and we listened! CDROM2GO is proud to announce that US Digital Media's DiscStudio design software is now completely free to download and use! This software allows users to create their own custom designs for do-it-yourself media printing. DiscStudio provides a wide variety of layout and design options in a simple yet intuitive program. Use it to create more than two dozen different types of printable creations including full size CD Labels, miniature disc labels, business card CD labels, CD jewel case inserts, DVD case inserts, and more. This fully-functional software application brings CD and DVD cover and disc design right to your desktop! A library of over 1,000 great stock background and clip art images are included to get you started. This software is available to you for FREE courtesy of CDROM2GO.COM. DiscStudio is a great solution for small to mid size businesses, home users, churches, schools, and other organizations. What do I do after I download the software? Save the download to your desktop. Extract all files. Double click on "SETUP.EXE" to install software. Reference the Manual or Frequently Asked Questions for great tools and tips. You can also read our DiscStudio software review to find out more about what the software can do for you! Ready to design and print! Once you open your software simply pick your type of US Digital Media or compatible brand label or insert paper template you will be using and design away. Before you print the first time do a quick printer alignment as detailed in the Quick Start Guide. This will align the software with your printer so you will get accurate prints saving you time and paper! To learn more about the software or to purchase a disc of the software see Disc Studio Labeling Software. Support: This free download includes limited online support only. We do not offer phone support, please refer to our questions page or instruction manual for support or use our online form to submit a question.